I am married to my wife Valerie and have two grown up daughters. 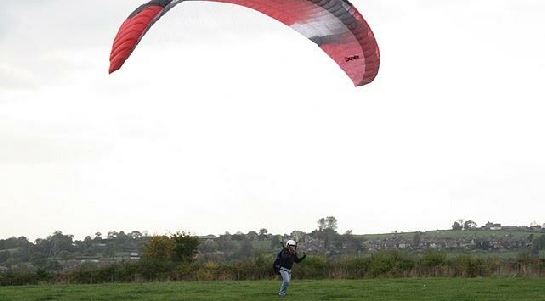 I first learnt to fly foot launched paramotors about 6 years ago but with the advancing years, I am 63 years old, started to find them a little on the heavy side so looked around for a wheeled version so that I could continue flying on a limited budget. I discovered the Aerochute about 2 years ago and it fitted my needs so purchased one and learnt to fly it gaining my NPPL Powered Parachute rating license in October 2014. I love the freedom that this form of flying brings. When Michael suggested the Coast to Coast trip it was a no brainer for me, a real challenge involving flying with the added bonus of raising money for a really worthwhile cause, Cancer Research. Unfortunately we are all not too far removed from someone who has been struck down with this disease. We may be slightly mad but what is for certain is that that we will have an enjoyable adventure with memories of the trip to last a lifetime. All we need now is the weather gods to look favourably on us so that we can successfully make the trip.